Multilingual marketplaces are becoming the next final move for even small to medium businesses. Do you know why? Today, around 75% of the internet communities use their native language to communicate and perform other online activities. It simply means that if your marketplace is still only in English, you're losing some of your profits and that could be huge! You have easy options to turn your single language store into a multilingual marketplace, while you're using WooCommerce. There are some facts you need to consider before and after making your move. In this article, we are going to show you how to develop the WooCommerce multilingual marketplace with a detailed guideline. If you're using Dokan (The most popular WooCommerce multivendor marketplace builder), it's easier to make your job done. Let's start with this basic fact. It's simple that if you want to increase the store's visibility and sales, you should develop a multilingual site. 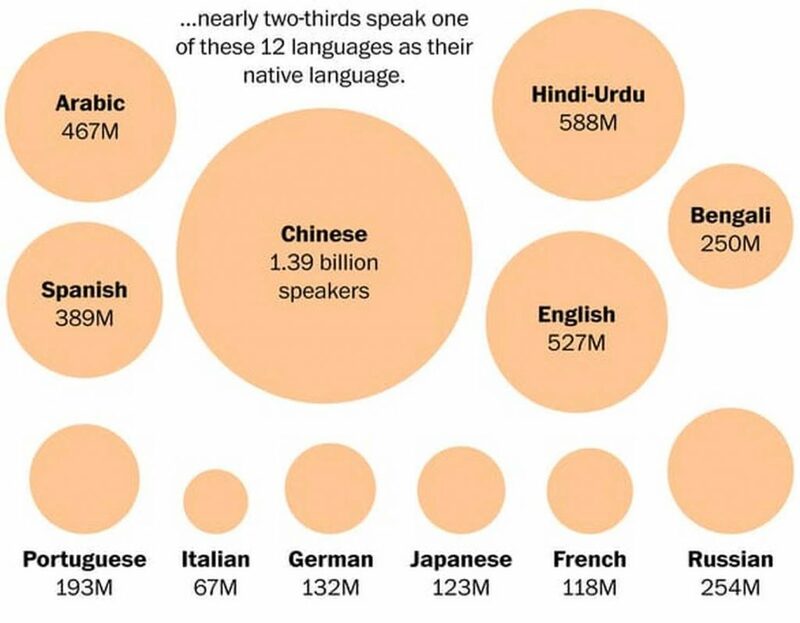 To become global, a multilingual site is a key. More language means more visitors, more engagements, more sales, and more profits. A multilingual store has a lot of benefits. But, if you're running a store with limited products targeting a local audience, this isn't the right time to create a multilingual store. Consider these facts to make a wise decision. Are you already getting International traffic? Do you have enough support tickets from foreign/global customers? Are you ready to manage essential formalities related to sales like taxation or shipping? You can easily find and measure necessary data using Google analytics (Check Audience- language and location field) or a solution like WooCommerce conversion tracking. Also, as a marketplace owner, you may already have the clear idea about your customers, and options to get notified about their activities. You can understand your needs and measure your capabilities better than anyone. Without a clear vision and enough preparation, building a WooCommerce multilingual store could be a waste of time, money, and efforts. Online business today is all about data and smartness. So be smart while making a big decision and try to rely only on actual data. What Would You Get Creating a WooCommerce Multilingual Store? A multilingual store can serve you in many ways. Check some core benefits of a WooCommerce multilingual store. You can deliver the contents to the native language which is already set by your visitors on their browsers. Opportunity to target more regions precisely. There is a general acceptance that a company with multiple languages must be global! With a localized store, clients will appreciate your feeling of their culture. When you reach to people in a language that is not your own, the whole world opens up to you! Sales are the driving force behind any business, you know that. A multilingual store is one of the most effective ways to meet this goal. We mentioned some core advantages of a multilingual store. Now, check some case studies. Net Media Planet (an online advertising industry) got on average of a 20% increase in conversions. Global shoes manufacturing company like Bata Industries built the multilingual site to ensure better user experience. Still confused?… According to Common Sense Advisory- 75% of Internet users do not make important buying decisions except the product information is in a language they can read or speak! So, what will you do? There are different ways and solutions to turn your single language store into a multilingual store or marketplace. We are going to show you four easiest but effective solutions. WPMLis a premium plugin- designed to easily create a WordPress site in several languages. Its default install is available in over 40 languages. Moreover, you have options to add a new language using its language editor. WPML’s pricing started at $29 for blogs and $79 for CMS. 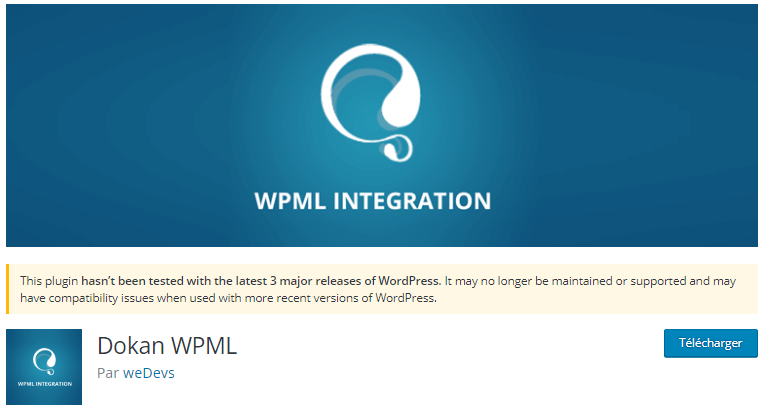 To start using WPML, you need to download and install it manually. Go to the official website of WPML and choose your plan- Multilingual CMS. Once you installed the solution and registered, You will be able to receive its automatic updates and installations for other components. Check this step by step official guideline to start the process. When you are done, your site is now ready to translate content in any language you want. In this step, you should know that there are two different ways to translate your content using WPML. Go ahead to explore the translation process. Quality is the main thing you should consider while translating your contents. 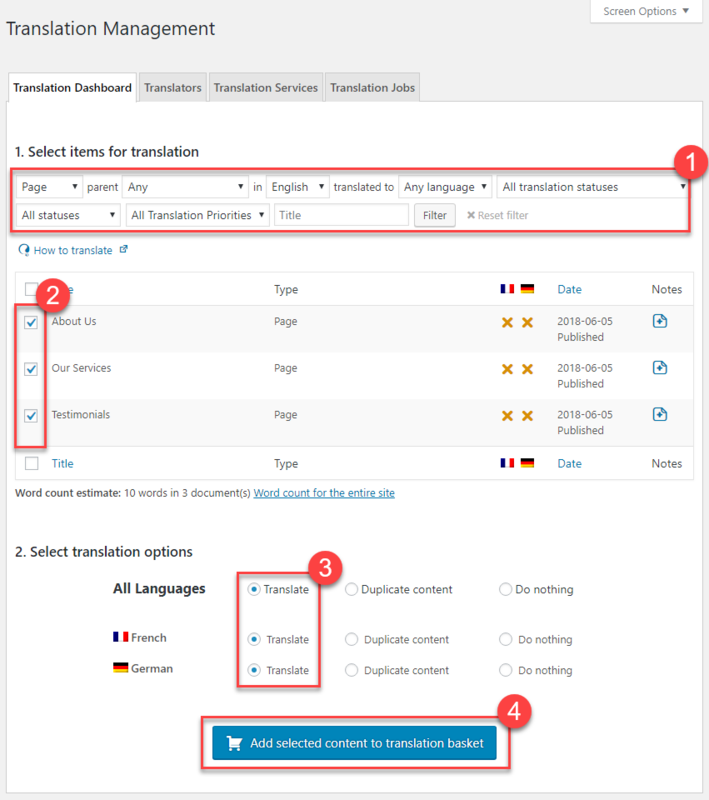 With WPML, You can manage your translation works using the Translation Management Add-on. Finally, click on the button- Add selected content to translation basket. See the steps in below screenshot. Need more help? Click to see the complete process. This add-on will help you sending contents for translation, checking quality and updates etc. If you are the only person to translate your store's content, you don’t need to use Translation Management. Use the icons like plus & pencil etc. from your dashboard to easily translate and update. See the icons. Pencil Icon means your content is already translated. Plus icon means this is still on the waiting list. Check WPML documentation to learn more. You can see and check your translation queue with WPML to translate necessary contents and ensure real-time updates. WPML is one of the best WordPress language translation plugins to help you develop and manage a multilingual store. 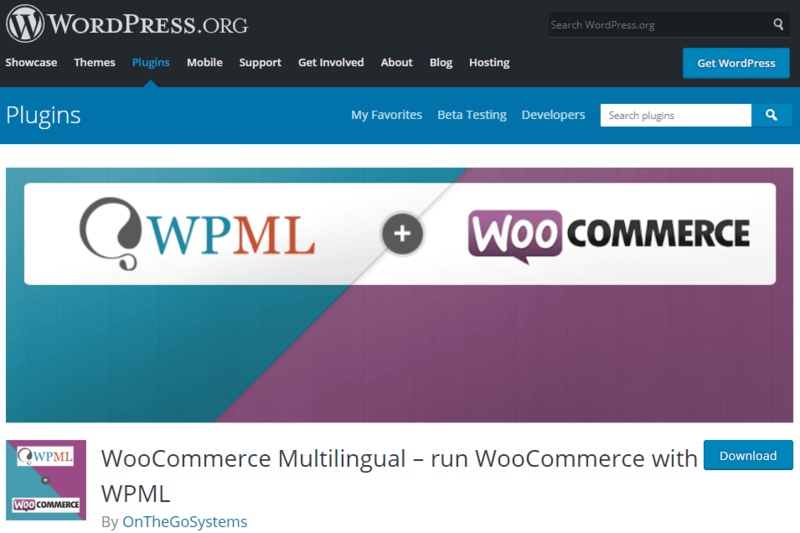 WooCommerce Multilingual Plugin & Why to Add This to WPML? 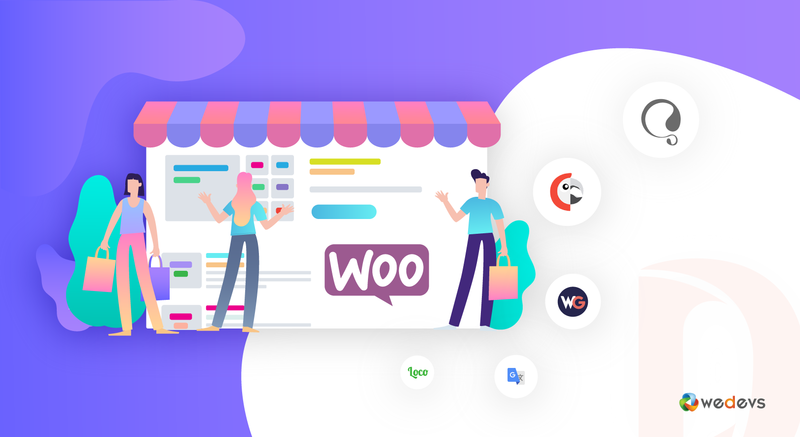 WooCommerce Multilingual is a dedicated plugin for WooCommerce product translation management created by WPML developers. You need to install the WooCommerce Multilingual plugin to ensure full support for your WooCommerce multilingual store. WooCommerce Multilingual is the customized solution for the multilingual eCommerce WordPress site based on WooCommerce. To ensure the best practices of WPML, Check WPML’s Official documentation. 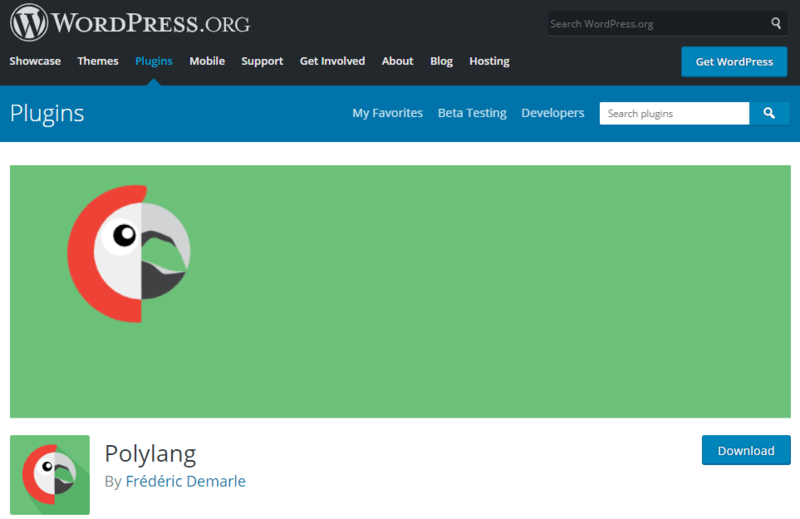 Polylang is a plugin to make multilingual WordPress websites. This solution does not integrate automatic or professional translation. You have to set the language either by the content or by the language code in URL, also you can use one different subdomain or domain per language. 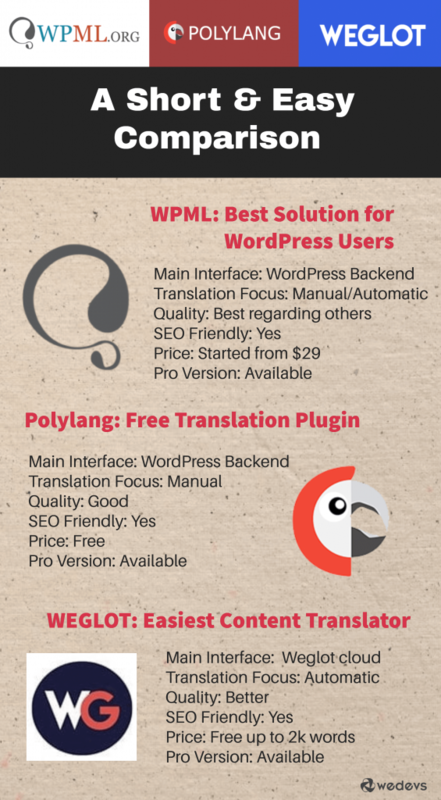 With over 400,000 installs, Polylang is one of the most popular WordPress language translation plugins. Yes, but you need to have a separate addon- Polylang for WooCommerce and that will cost you $99 for one site. You can’t build a WooCommerce multilingual store with Polylang’s free solution. Polylang for WooCommerce allows you to combine the power of two popular WordPress plugins (WooCommerce and Polylang) to create a multilingual shop. It allows you to translate all the necessary fields directly in the WooCommerce interface. You already know that- with Polylang, it’s very important to set the language for all existing posts, pages, categories, and tags. Otherwise, you can’t find them on the frontend. Go to your site’s dashboard and install Polylang by clicking on Add New Plugin option. After installation and activation, you would see Polylang icon on the top bar of your dashboard. Now, see how does Polylang actually work. Let’s create a page in 4 languages. Choose your default language in the dropdown list. You can select an already existing page as translation. The plus (+) icon will then turn in a pencil icon. You can create a new translation by clicking on the (+) icon. The pencil icon will allow you to edit the translation. Check the process in below screenshot. With Polylang, the operation for other fields like posts, custom post types, categories or tags is exactly the same. Now let's see how to use these icons perfectly. The check icon means that this page is already in the language. You can edit the page by clicking on it. The plus icon will allow you to add a new translation. The pencil icon refers that a translation exists. You can edit the translation by clicking on it. It is not mandatory to translate all the content. You can filter the content by language. Here is how your pages are displayed in the table. To learn the complete process, you can check Polylang official documentation. Go to your Dashboard and select Woocommerce > System > Tools and click on the ‘Install pages’ button. Install polylang for a new WooCommerce site and get a go! You have the opportunity to migrate from WPML to Polylang. This is not something like which one is better- WPML vs Polylang?… It’s all about your choice and priority when you feel or need. Just Install the plugin WPML to Polylang and follow the guideline. Another popular WordPress multilingual site creating tool. The unique feature of Weglot is- it can automatically detect and translate your text content. It’s an easy and effective multilingual extension. Trying to find a perfect WPML alternative? It’s Weglot! How to Install Weglot for Your WordPress Site? WEGLOT ensures an easy set up for even new customers who have zero coding knowledge. Go to your site’s dashboard and install the plugin by selecting Add new plugin option. After installation and activation, you need to add Weglot API key. To get your API key, you have to create an account on Weglot official website if you haven’t yet. Now just select your original language and destination languages. Click on Weglot tab from the setting bar and select Weglot Translate. And you have completed the process! Weglot has a dedicated support team to help you anytime. Check out their official set up page to learn more and get support for your further needs. 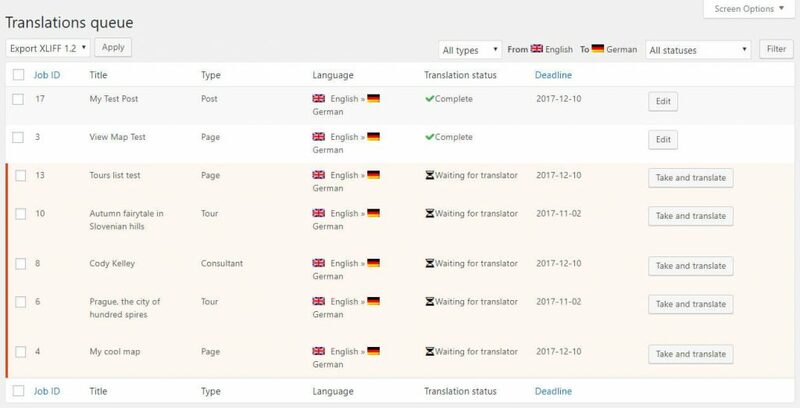 Weglot has a unique dashboard to add and edit translations. Also, you can purchase professional translations to ensure the quality of your store’s contents. Yes, you have the option for migrating to Weglot Translate. Don’t be afraid! It’s easy. If you need to import some translations, visit their support page or simply mail at support@weglot.com. Weglot comes with a detailed pricing strategy. Choose your plan from their 5 different plans that started from $8.25 in a month. We already described how to turn your single language store into a multilingual marketplace using WPML, Polylang, and Weglot. Now you can ask- which one is better to start with? Check out this short infographic to compare these solutions and pick up the right one for your WooCommerce multilingual store. We mentioned necessary information including- Main translation interface, Focus, Quality, Price, and updating. These are enough to compare and make a primary decision. Up to now, we only talked about translating single vendor WooCommerce store. What, If you have a multivendor marketplace? As a WooCommerce based marketplace owner, you may already know that Dokan is the most popular multivendor marketplace builder in the WordPress Community. 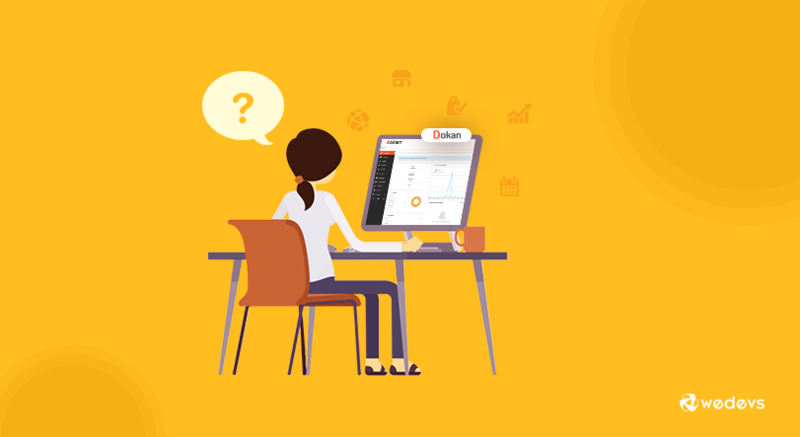 With Dokan, you have easy option to display your vendors' dashboard, product categories, store pages etc. in various languages. You can easily turn your marketplace into the multilingual marketplace by just adding an extension- WPML Integration for Dokan. It actually enables you to use WPML (The WordPress Multilingual Plugin) to your Dokan powered WordPress multivendor marketplace. How to Configure Dokan WPML? To enable WPML for your Dokan Multivendor Marketplace, you will need the following plugins. Configure WPML & WooCommerce Multilingual plugin as we mentioned earlier. Install and activate the Dokan WPML Integration plugin. Create translation of your pages and products and you are done. You can translate all your contents and other fields Dokan WPML integration. You will be able to translate the following fields into multiple languages using Dokan WPML integration. Check out the step by step guideline to know more about this extension to implement it perfectly. Install and activate this free extension to your WordPress multi-vendor marketplace for ensuring a quantum leap over your competitors. With over 10,000 multi-vendor marketplaces, Dokan is one of the leading marketplace builder solutions out there. Explore some great marketplaces which are already translated into different languages using Dokan WPML integration. Tomor market actually is the Arabic language based eCommerce marketplace. They translated their store into the English language to reach new customer bases across the world. See how easily they are running and managing their Dokan powered multivendor marketplace in both Arabic and English languages, by just one click! Good Morning Laos is one of the most popular multivendor marketplaces from Laos. They also developed a dedicated WooCommerce multilingual marketplace using Dokan WPML integration. The site is available in both English and Lao language. There is a huge number of Dokan powered WooCommerce multilingual marketplaces to explore. Check to make a wise decision and also to prepare a better plan. These are not manual, also not capable to provide quality translate all the time. That is why you should consider manual translation using plugins. Translating your content isn't tough but setting up the site for WooCommerce multilingual is a bit tricky. There are three facts you need to consider and ensure the solution as it required by Google algorithms. What Should You Translate to Get Desired Result? If you ignore or fail to complete the requirements, you may face a lot of challenges to get the desired Google ranking. Online business has no boundaries. To become global, WooCommerce multilingual store is a key. Since you have products and essential support, why are you waiting? In this article, we have described all the necessary steps and possible ways to easily build a multilingual store. If you're running Dokan powered multivendor marketplace, today it's even easier to translate your marketplace in several languages. So, go ahead with developing a WordPress multilingual marketplace and ensure a quantum leap over your competitors. 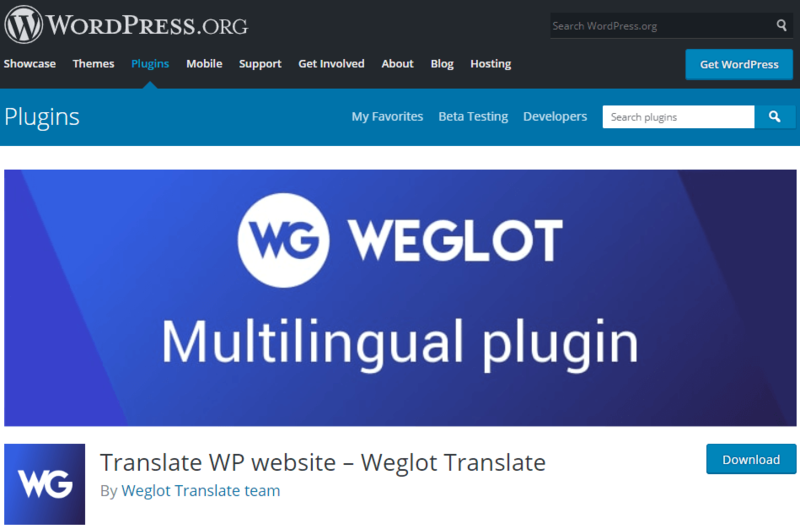 Do you already have a wooCommerce multilingual store or are you using a WordPress translation plugin? Let us know. If you have any query or confusion, we are always here to help you!